WASHINGTON (CNN) -- Several senior Democratic advisers to the White House are urging President Obama to further step up his personal involvement in the health care debate, as administration allies privately warn the president's push for a major reform bill is hitting major roadblocks at a critical juncture on Capitol Hill. 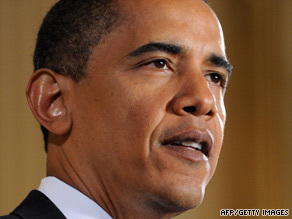 President Obama says health care reform is one of his top priorities. One of the Democratic advisers told CNN there is fear within the party that the president's signature issue is "on the rocks" because of dramatically high cost estimates for separate bills being drafted by Sens. Edward Kennedy, D-Massachusetts and Max Baucus, D-Montana. The Congressional Budget Office's estimate for the Kennedy bill -- that it will cost $1 trillion and yet leave millions of Americans without health insurance -- has given Republicans strong political ammunition to charge reform may be too expensive at a time of massive federal deficits. "We're going to need the White House to step it up a little bit and get more engaged," said a second Democratic adviser, who acknowledged concerns that Republicans are gaining steam in the message battle. "We've got some time to sort this out, but decision time is just around the corner." This second Democratic adviser said the CBO's $1.6 trillion estimate for the Baucus bill was particularly jarring to Democrats because it was "several hundred billion dollars more" than expected. Baucus, chairman of the Senate Finance Committee, announced this week he's pushing back the official unveiling of his legislation until after July 4 -- a delay that imperils White House hopes the Senate can finish work on the issue before leaving town for its August recess. But senior White House officials contend that while there are legitimate concerns about the status of the legislation, the president is still confident the setbacks are a normal part of the legislative process and it will eventually get back on track. "We're not hysterical," said one senior White House official. "We've seen this movie before: [the Congressional process] looks like a total mess, nothing is getting done, and then something happens." White House press secretary Robert Gibbs said Thursday that despite the partisan rancor, Obama believes Congress can work out its differences and deliver a bill in 2009. "I don't think it's a surprise that this is going to take some time to do," he said. "It's an issue that we've been discussing for 40 years." Amid the Democratic concerns about the need for the president to take on a more active role, Obama is planning next Wednesday to appear in a primetime special broadcast on ABC News. The program entitled "Questions for the President: Prescription for America" will be moderated by Charles Gibson and Diane Sawyer and will feature questions from audience members in the East Room of the White House. Jim Manley, a senior aide to Senate Majority Leader Harry Reid, D-Nevada, told CNN that while there are some ominous signs for Democrats right now, party officials are confident they're just bumps in the road. "Be very careful to sort out the wheat from the chaff, the noise from the reality," Manley said. "It's not easy, but we can do it." But in a sign Democrats may be nervous that they will not be able to reach 60 votes in the Senate for Obama's plan, Reid reminded reporters this week that in order to pass the health legislation he still reserves the right to use arcane budget rules known as "reconciliation" that require only a simple majority of 51 votes. Republicans accuse Obama and the Democrats of trying to rush through what they say is flawed legislation in 2009, before the politics of mid-term elections in 2010 and the 2012 presidential election. "I hope we don't become victims of a deadline when we want to get it right," said Sen. Michael Enzi, R-Wyoming, who accused Democrats on the committee of forcing an incomplete, partisan bill on the panel. "We're doing it too fast." At issue is how to best reduce the cost and increase the reach of the current health care system, which officials say is increasingly draining personal, corporate and government budgets while leaving 46 million Americans without health insurance. Obama warns that failure to act now would bring far worse economic difficulties than the costs of plans under discussion. Democrats generally favor a government-funded "public option" to compete with private insurers. Republicans say such a step would lead to a government takeover of health care, which they oppose. The parties agree on several principles, including an emphasis on preventive care, cost-cutting measures in the existing Medicare and Medicaid programs and a halt to denials of coverage because of pre-existing medical conditions. Meanwhile, a bipartisan group made up of former Senate Majority Leaders Tom Daschle, Howard Baker and Bob Dole has offered an outline for an alternative plan intended to overcome the deep party divisions. The proposal by the Bipartisan Policy Center calls for a budget-neutral plan that would include taxing some employer-provided health care benefits for workers. The plan stopped short of an outright government-funded public health care option, but called for various forms of government assistance to help make coverage more affordable and available. It also called for requiring all Americans to have health care. Both taxing health care benefits and the lack of a public option go against stated Democratic positions, while the mandate for individual coverage is opposed by Republicans. Such a bipartisan approach is what the issue requires, Rep. Jim Cooper, D-Tennessee, said at a Thursday news conference held by legislators from both parties. "We're not here to slow it down," Cooper said of his call for the two parties to work together on a consensus measure guaranteed to pass. "The process is already creaking under it's own weight," he said. "I have a message for Democrats: if you want to get health care reform done, include Republicans and take the sledge-hammer threat of reconciliation off the table," said Antonia Ferrier, spokeswoman for House Minority Leader John Boehner, R-Ohio. "Using this heavy-handed tactic shows they can't even reach agreement within their own party -- and that their moderates have abandoned them."